Raise your hand if you grew up on PB&J. Raise your hand if you’re a creamy person. Now raise your hand if you adore PB&J to this day – and suspect you always will. In a pinch, on a hike, camping, picnicking in the park, when you’re feeling nostalgic, or when your pantry contains nothing else. Peanut butter and jelly sandwiches are where it’s at. Now raise your hand if you don’t like PB&J. This is probably where you’ll want to stop reading this post. 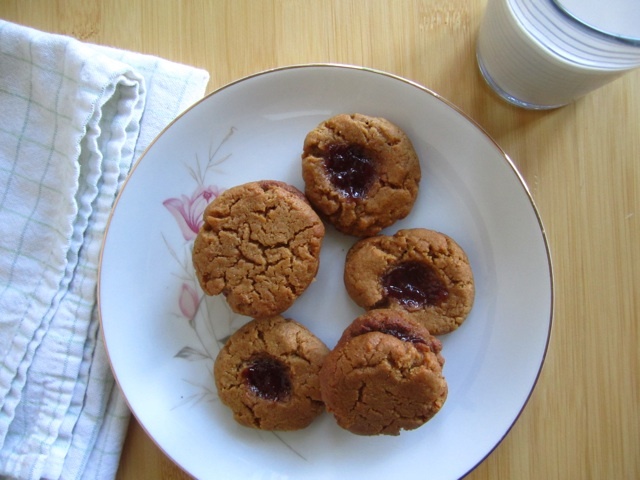 These cookies are the sonnet you never knew you ought to be singing to the humble yet all-satisfying combination of peanut butter and jelly. They’re the addiction you’re going to regret. They are so easy to make and contain so few ingredients that I bet you could go make them right now. Just as we all have our preferences – crunchy, creamy, whole wheat, Wonderbread white, strawberry, blackberry, apricot – the beauty is that these cookies have a built-in capacity for options too! 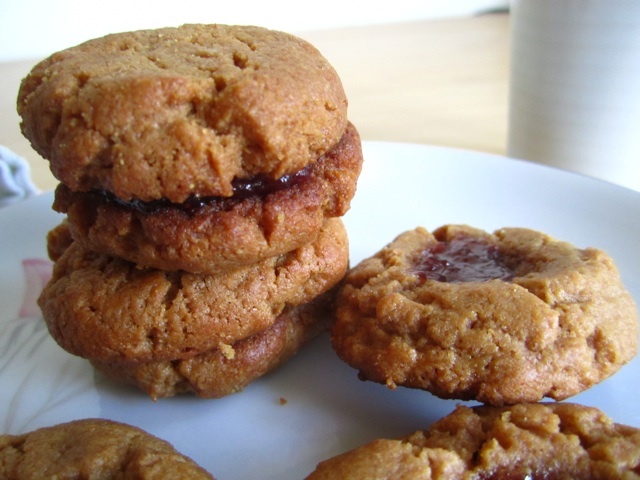 Feel like a PB&J cookie sandwich? Go for it! Prefer blackberry preserves over orange marmalade? Well, the world is your oyster, after all. Perhaps the very best thing about these cookies? They are without flour — totally gluten free. Yup, no need to bother with those superfluous carbs. Just the good stuff. Also known as the PB&J your mother would never in a million years have let you eat. So, my dear grown-up friends who are still not fully grown up at heart: this cookie is for you! Jelly, jam or preserves – about 1/3 cup. Preheat oven 350°F. Line 3 baking sheets with parchment paper or Silpat baking liners (not necessary if using nonstick cookie sheet). In the bowl of an electric stand mixer fitted with a paddle attachment (you’d probably be fine with handmixers too, if that’s what you’ve got), beat the peanut butter, brown sugars and baking soda on medium speed until blended, about 1 minute. Add the eggs and vanilla and mix on low speed until just blended, about 25 seconds. You will be left with a moist, crumbly sort of dough that should come together if pressed. Shape level spoonfuls of dough into balls about 1 inch in diameter, or use a 1 ½ tsp. cookie scoop. 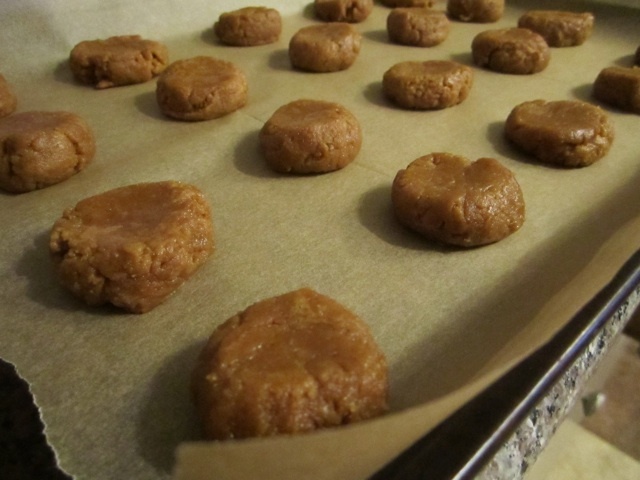 Arrange the balls about 1 1/2 inches apart on the prepared baking sheet. Press the balls of dough down slightly. 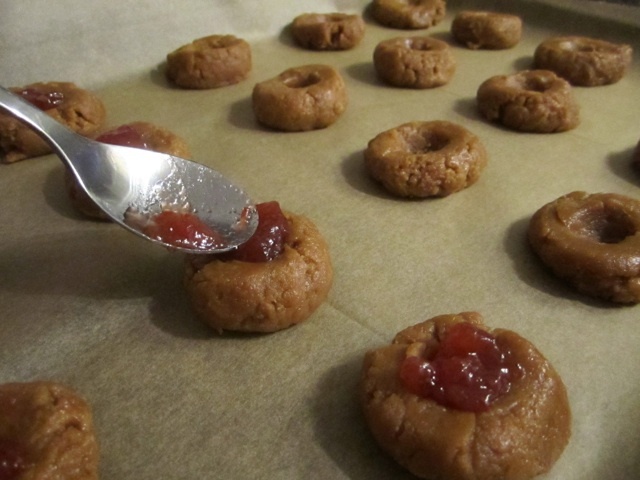 If filling with jelly, make a small indentation in the middle of each cookie and fill with jelly, jam or preserves. Repeat with each cookie. Bake one sheet at a time until the cookies are puffed and crackled but still moist-looking, about 10-11 minutes and no longer. Remove cookie sheet from the oven and allow the cookies to cool for about 10 minutes. If you are making cookie sandwiches, turn half of the cooled cookies over so they are flat side up. 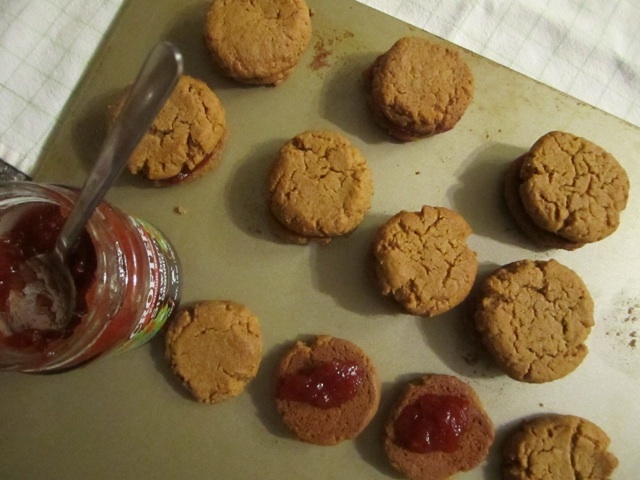 Spoon or smear jelly, jam, or preserves onto the center of each cookie. Top with the remaining cookies, flat side down. Press gently on each cookie to spread the filling to the edge. Makes about 30 sandwich cookies or about 60 cookies, depending on how big your cookies are. By no means is this an exact science: I made a combination of both and came out with 12 sandwich cookies and 37 regular cookies. This entry was posted in Gluten Free, Not pie and tagged cookies, gluten free, jam, jelly, peanut butter. Bookmark the permalink. Just made these, delicious! Thank you!